If I wanted to be kind, I'd call Luca Guadagnino's Suspiria remake "visually striking" and "stylish." If I wanted to be brutally honest, I'd call it "tedious", "pretentious", and even "painful" (although not in a good way). Any successful horror film, whether high-brow art or low-brow exploitation, makes the viewer feel something. Yet about the only emotional response provoked by this overlong slog is apathy. Watching Suspiria, I was reminded more of The Neon Demon (which I hated) and mother! (about which I was ambivalent but would never claim to like) than the 1977 gore-soaked Dario Argento cult-classic original. Suspiria's supporters will argue that the movie's somnambulant first half represents a "slow burn" necessary to build up to the "shocking" twists and revelations at the end. Unfortunately, the "burn" is so slow that it comes to a complete stop. Guadagnino will have lost most of his audience before he increases the pace (and, when he does so, it's only by a little). Although parts of the ending are incomprehensible, those that make a modicum of sense are ludicrous and unsatisfying. This is what happens when a new screenwriter tosses out the original climax and replaces it with something of his own devising. And, although Guadagnino's imagery is suitably creepy and unsettling during what I'll call the "final performance," the seriousness with which he approaches the material is unintentionally borderline comical. Gone are the echoes of black humor and bloody exuberance embraced by Argento. This Suspiria wants to be seen as serious art - demented, perhaps, but infused with meaning. Not even mother! had such aspirations. For all that Suspiria fails as a drama, a character piece, or (most importantly) a horror movie about bloodthirsty, body-snatching witches, the dance performances are effective. These sequences, which sadly are few and far between, shake the movie into wakefulness with a jolt of energy. 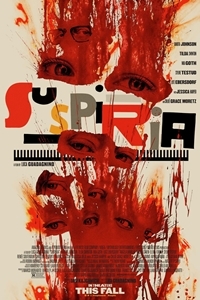 Partway through, I found myself wondering whether Guadagnino might be a better match for a remake of Showgirls than Suspiria. The director's involvement seems an odd match; anyone expecting something along the lines of Call Me By Your Name will be left wanting. It's as if the two movies were made by different craftsmen. Dakota Johnson's performance, although lively and athletic during the dance sequences, leaves a bit to be desired in subdued moments. Susie is flat and artificial and, although part of the blame goes to the director and screenwriter, Johnson doesn't compensate for those deficiencies. Tilda Swinton is expectedly weird but there's nothing standout about her performance except that she's passable as a man (no longer an impressive feat in this era of motion capture and CGI, although neither was used in this case). Chloe Grace Moretz has minimal screen time and, during her one significant scene, she's not recognizable. The good thing for anyone with a morbid curiosity to see this interminable ruin of a film is that it has been produced by Amazon Studios and, as a result, will soon be available for free streaming for anyone with an Amazon Prime account. At 152 minutes, the movie is broken into six acts (plus an epilogue) - sleeping through (or skipping) a few of those acts might cause some confusion but will also reduce the amount of time invested/wasted. I'd suggest applying the mother! litmus test. Those who loved Darren Aaronofsky's bizarre plunge into surreal horror might appreciate where Guadagnino has taken Suspiria. Nearly everyone else will find that this deserves the derision and disdain it will receive from mainstream movie-goers nationwide.